German tyre manufacturer Schwalbe has been concentrating on bicycle tyres since the 1970s, and they aren’t afraid of raising the bar for modern tyres across all bike disciplines. Schwalbe tyres regularly convince the testers of the specialist press and help the world's top cyclists win a place on the podium. They are also the first choice for many cycling fans; from tour riders to MTB downhillers. Schwalbe manages to reconcile contradictory tyre demands and is often ahead of the competition with tubeless, plus formats, pro-core or puncture protection technology. Available variants: 42-622 | 28x1.60" · 47-622 | 28x1.75"
Available variants: 25-622 | 28x.1.00"
Schwalbe is synonymous with bicycle tyres. Not only does the German tyre manufacturer help some of the world’s best cyclists win a spot on the podium, Schwalbe’s versatile and top-quality tyres are often the first choice for cycling enthusiasts. Designed to withstand different weather conditions, Schwalbe tyres are tailored to the needs of all cyclists, from long-distance and rough terrain cyclists through to leisure and urban. 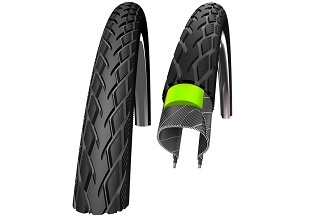 On the Bikester.co.uk website, you will find an extensive selection of tyres that are suitable for city, mountain and racing bikes, available in a range of sizes. Schwalbe offers reliable products that you can trust. For over 70 years, the German tyre brand has dominated the tyre industry, raising the bar on modern bike tyre manufacturing from the very beginning. A pioneer of the first highly specialised bicycle tyre, Schwalbe is well known for its innovative puncture-resistant product lines, Marathon, Big Apple and Big Ben, and continues to develop some of the best-quality bicycle tyres in the industry. The development of balloon tyre equipment and tubeless technology have further defined them as leaders in their field. Development and testing of a Schwalbe product take place in the laboratory before having to prove its worth in a rigorous professional cycle racing capacity. Previous tests have taken place on the Tour de France and Ironman Triathlon in Hawaii. How do I choose the right tyre for me? Determine the type of cycling and the surface you wish to ride on. The grip of the tyre can usually be measured by the roughness of its surface; the more raised the tread, the more grip the tyre has. Other notable features are its speed, puncture protection and wear resistance. Weather conditions also play a big factor and are important to bear in mind when choosing the most suitable tyre for you. Cycling in snow and rain often requires a tyre with coarser patterns that is designed to perform well on most surfaces. For mountain bikers, Schwalbe’s deep tread tyres built for high speed have an exceptional grip on tricky terrain, with the ability to tackle dangerous bends and tricky turns. Their tyres for off-road biking are designed to prevent clay and other substrates from getting caught in the tyre. Schwalbe tyres are also available to those who like to drop in some tricks on a ramp. The tyres have a good forward and backwards grip on different substrates, including gravel and asphalt, and enable easy jumping. Thanks to their superior speed and grip, Schwalbe tyres for racing are some of the most popular around. Lightweight and available in a range of different colours, Schwalbe racing tyres often don’t need an additional inner tube (the inner tube and tyre are one). Available under the Lugano and Durano product series.